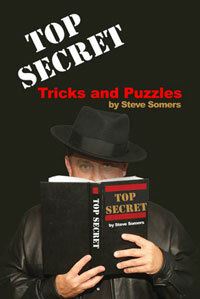 In this book, Steve has included some of his favorite tricks and puzzles. Using a spy theme, the book is divided into three sections: For Your Eyes Only; Need to Know; and Impossible Missions. Solutions, if needed, are provided at the end of the book. As well, there is a bonus section online to those who discover the secret username and password. 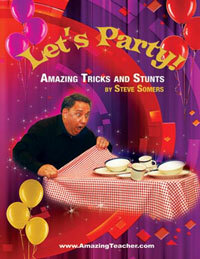 Let’s Party celebrates a variety of classic tricks and stunts based on science. Some involve a bit of psychology, physics, and even some math. But don’t worry, most of the stunts use things you carry in your pocket or objects you might find around the house. Many of the effects can be done without any setup or planning. This amazing coloring book is no ordinary book. It’s magic! Well, it seems like magic. You can display the book with all blank pages, then with a wave of the hand, black and white drawings appear. Finally, ask the audience to use their imaginations and throw some colors at the book and WOW . . .all the pictures are now in full-color. 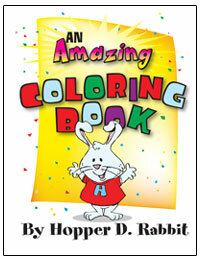 NOTE: This is a magic trick, not a real coloring book! 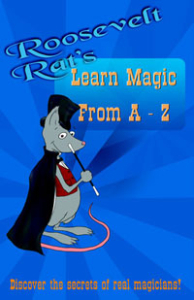 Join Roosevelt Rat, one of Steve’s puppets, as he leads you through fun lessons that teach you how to think like a magician. Each lesson explains a magical concept and one of Roosevelt’s favorite tricks. In no time at all, you’ll be able to read minds, predict the future, float a stuffed animal, perform mind-boggling card tricks, and much more! This upside down book was written by two of Steve’s puppets: Tucker the Turtle and Franklin the Frog. It is an edutaining look at how the two became friends. 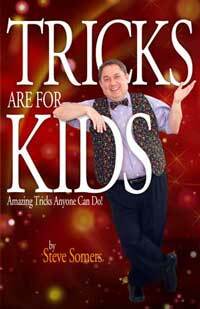 The book also includes poems, games, jokes, riddles and even the secrets to performing a couple of tricks. Free access to an online section is included for some learning and fun. 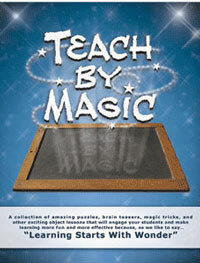 Written especially for teachers, this book shows step by step how to use simple magic tricks in the classroom to get students’ attention, make lessons more memorable, reward good behavior, review past material, and build a positive rapport with students. It includes an index of topics for all grade levels plus a video of each trick being performed is available online! Are you looking for an easy way to amaze your friends and family? 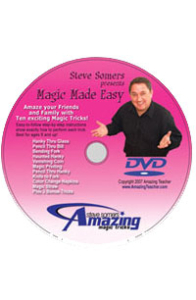 Magic Made Easy provides simple step-by-step video instructions for more than a dozen tricks. The video presentations show exactly how to perform each trick. This DVD is best suited for ages 8 and up. Steve’s first book was originally written for a summer magic camp. The book contains simple tricks anyone can do. It includes a beginner section for those just getting started as well as an intermediate section for older students. But even adults will discover some amazing tricks to perform. The many faces of the Amazing Teacher is a fun and baffling mystery that will drive you crazy. It is available as 6″ x 11″ postcard. You may order a cardboard printout of this illusion. $2.50 including shipping!